TROY, MICH., September 2, 2015 – Plex, the leader in cloud ERP for manufacturing, today announced that Floracraft, the world's largest maker and supplier of floral foam products, increased production and reduced costs through its use of the Plex Manufacturing Cloud, helping the company expand to become a premier supplier to the world’s largest retailer. Headquartered in Ludington, MI, FloraCraft is a family-owned company that has served the floral arrangements sector for 70 years, primarily through independent florists. Seven years ago, FloraCraft sought to reinvent itself as a mass-market producer of floral supplies for the world’s largest retailers. As a result of the new strategy, Floracraft tripled its inventory and expanded to a portfolio of more than 12,000 products, with 3,500 SKUs in production at any given time. The company’s ERP technology systems couldn’t keep pace with the growing need to track the vast inventory and just-in-time requirements of big-box retailers. FloraCraft sought a manufacturing ERP solution that would optimize its processes and serve as a competitive advantage to help grow its business and improve profitability. FloraCraft implemented the Plex Manufacturing Cloud at four production facilities in Michigan, California and Arkansas and plans to roll out Plex to its Mexico facility. Plex’s cloud ERP has been in place at FloraCraft for more than two years and has helped the company achieve double-digit revenue growth, without additional labor hours. Real-time visibility into inventory, along with dynamic scheduling capabilities, fundamentally improved FloraCraft’s ability to serve customers and was pivotal in the company’s recognition as Walmart Supplier of the Year in 2014. Today FloraCraft was recognized as a Computerworld Data+ Editors’ Choice Awards honoree for achieving business benefits through big data and demonstrating real-world results and best practices. Using Plex, FloraCraft has achieved a unified view of its business – from the moment raw materials are delivered to financial reports – by collecting a host of real-time data from the materials, machines and people on the shop floor. From forecasting material needs based on big box customer data to monitoring work station performance and tracking inventory, this big-data approach helped FloraCraft expand into new markets and transform from a regional business into an industry leader. Read more about FloraCraft’s transformation. Listen to FloraCraft’s Steve Carlson describe how the manufacturing cloud makes it possible to predict costs and enables just-in-time supply chain capabilities. The Computerworld Data+ Editors’ Choice awards program was launched in 2013 by IDG’s Computerworld editorial team to recognize organizations that are mining big data to analyze and predict business trends and monetize this information. Organizations were asked to complete questionnaires detailing their big data projects, which were then reviewed by the Computerworld editorial team. From those questionnaires, honorees were selected for their ability to achieve business benefits through big data, and demonstrate real-world results and best practices. View the 2015 winners on Computerworld.com. 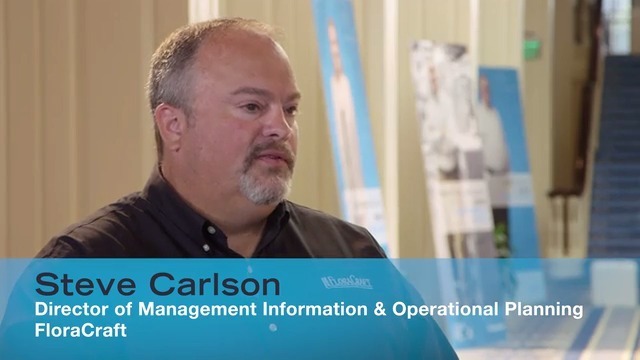 FloraCraft's Director of Management Information and Operation Planning, Steve Carlson on how The Plex Manufacturing Cloud has helped his business compete with the larger consumer brand suppliers.